If you love spaghetti squash, then you'll love this recipe for Spaghetti Squash with Garbanzo Beans and Kale. It's a crazy and unexpected match up of bold flavors that makes every bite so delicious. 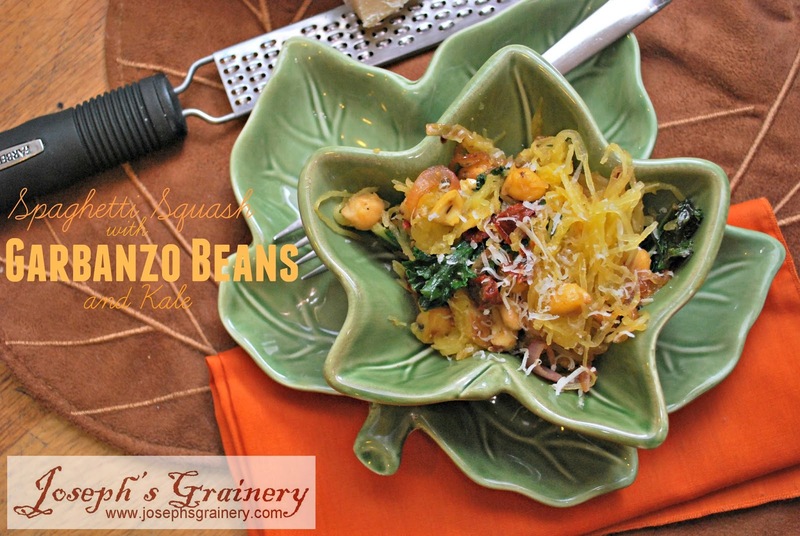 This dish is definitely a great taste of Fall! Slice your squash in half length wise, scoop out the seeds and pulp. Put the squash on a baking sheet with the cut side up. Drizzle the squash with olive oil and season with salt and pepper. Let the squash roast for about an hour or until the flesh is tender. Remove the squash from the oven, let it cool for a few minutes so that you can use a fork to scrape the squash into strands. Place enough oil in a large skillet to coat the pan. Add the shallot, garlic, rosemary, chili flakes, salt and pepper. When the shallot is just starting to soften add the garbanzo beans. Cook for a few minutes until the start to turn a light golden brown. Add the kale leaves and lemon juice. Once the kale has started to wilt, add the squash, sun dried tomatoes, cashews and more salt and pepper. Give it a good stir to mix it all up and then top with grated parmesan cheese.